I did it. 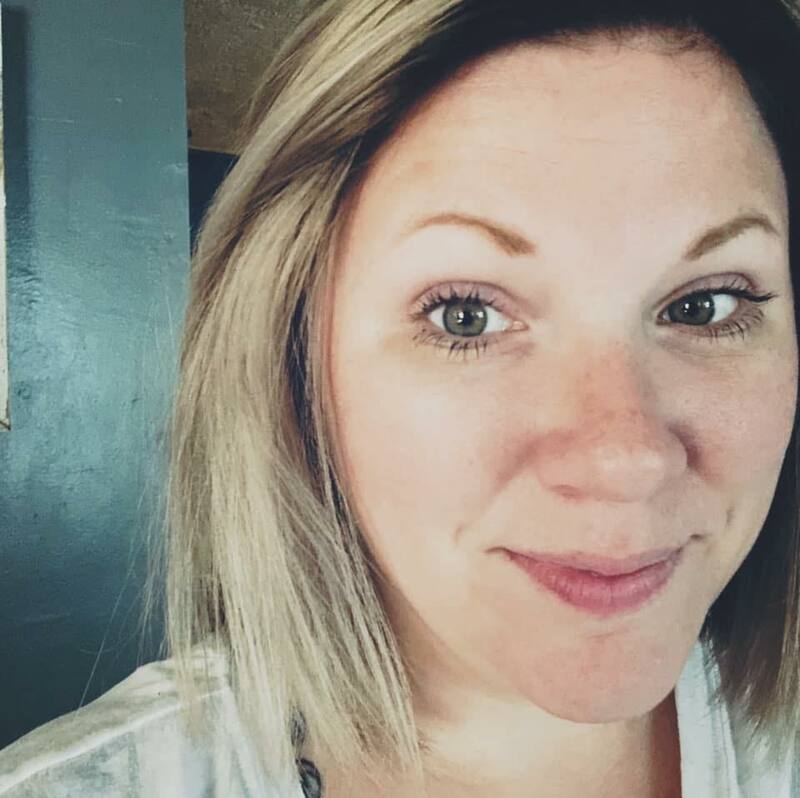 I took the plunge. I went bold. I went bright. 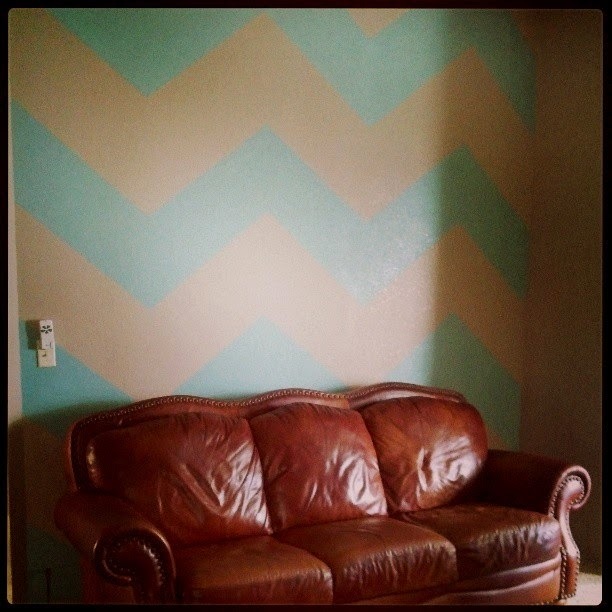 I went chevron. On my dining room wall. Yep, it is true. 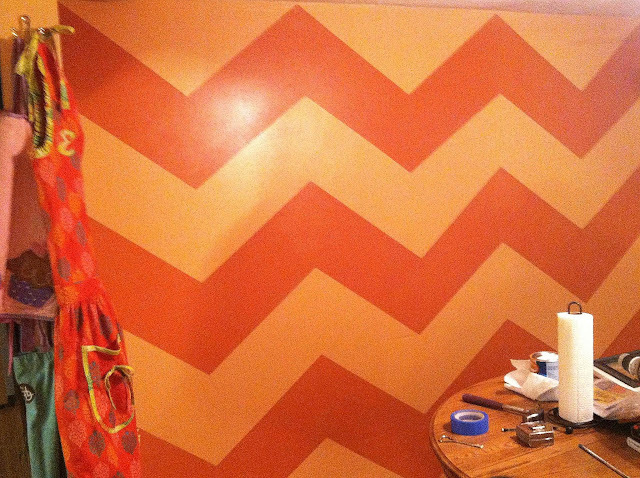 I finally gathered up the courage, patience, and the brain power needed to paint some chevron stripes on my wall. I was looking for something to liven up my kitchen/dining area. They take up about 1/4 of my entire house. Three years ago (I remember because it was supposed to be done in time for our daughter's first birthday) I painted and left an area for chair rail to be put up...yeah, that never happened. I went dark also. I believe it was "red ginger" and some "chocolate brown" or something. But I am having a serious case of cabin fever, and want something fresh and bright. So I settled on the colors "ripe tangerine" and "melon mania". Oh yes. Quite the change!! I am so happy with the results, and it wasn't near as hard as I thought it would be! 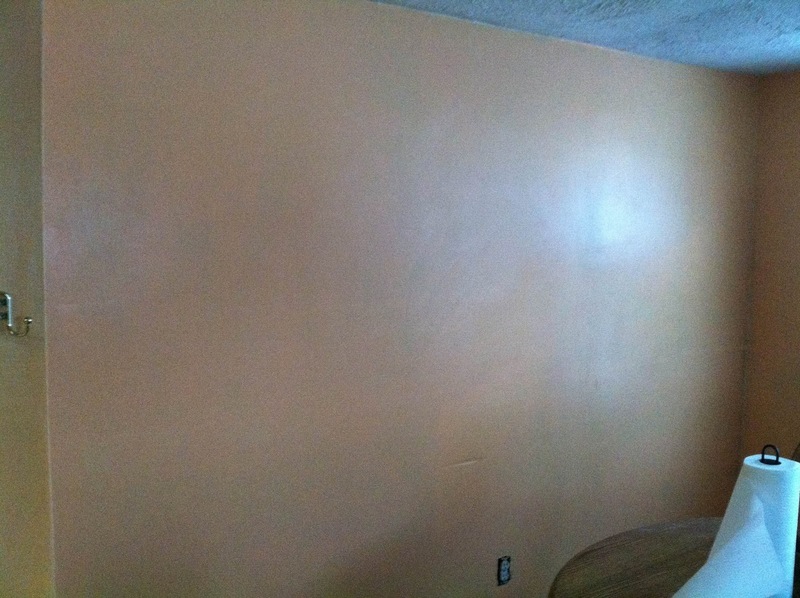 Originally I was going to paint all my walls the lighter color, the "ripe tangerine" and just paint this wall as an accent wall with the "melon mania". But then I decided breaking up the solids with the chevron stripe would be kind of neat! Paint brushes, roller, tray, etc. 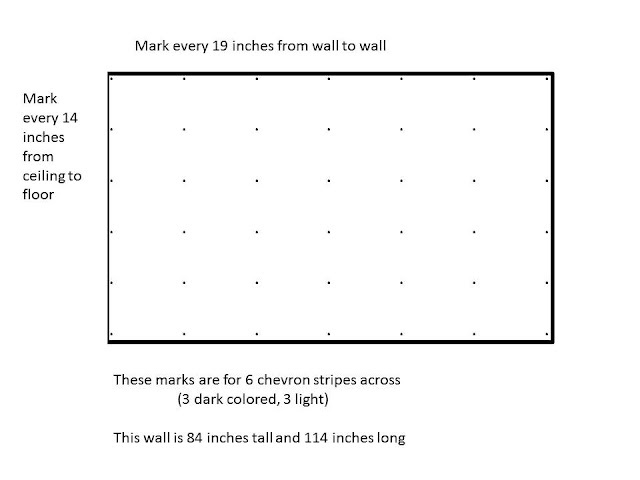 First I measured out my wall and mapped it out on a piece of paper. I recommend having an accent wall with no windows or anything breaking it up. Plus, it'll be a lot easier to map out the stripes. The wall I chose is 7 feet by 9.5 feet. (Convert to inches) 84 inches by 114 inches. 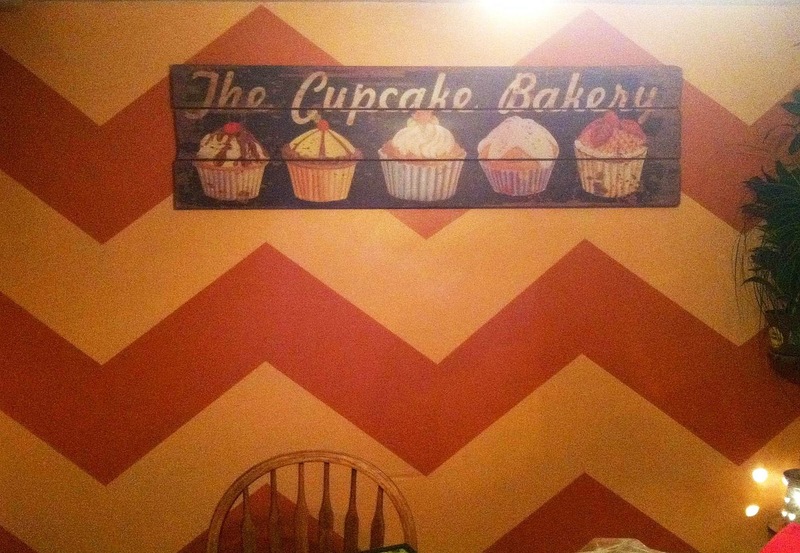 Divide the height by how many stripes TOTAL you want on the wall. This will include the dark and the light color. I chose 6. So I have THREE dark chevrons. 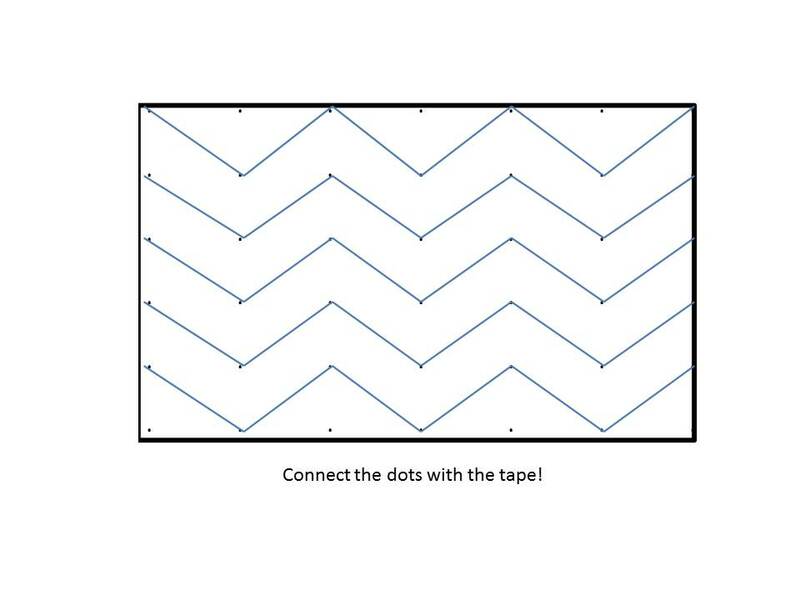 (114/6=19) The zig and zags will have their point every 19 inches. Map it out on paper to see if you like the total. You can see in the photo there are six columns and six rows. Having the squares help align the points so you get a better idea of what it will look like. If you are happy with the results, it is time to plot your measurements directly onto the wall!! I started on the left hand side of the wall, and from the ceiling I measured down 14 inches, and made a mark with a pencil. 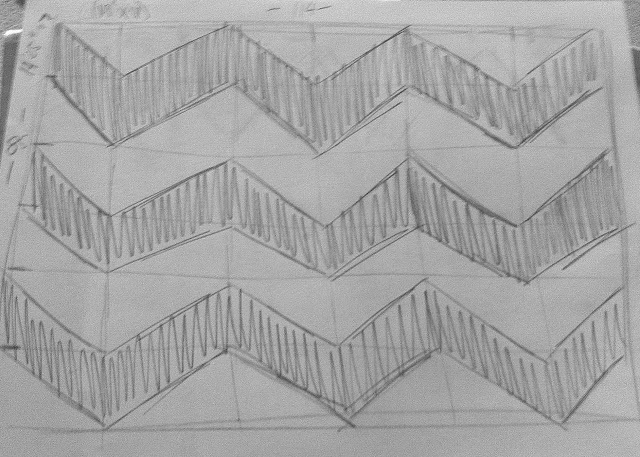 I repeated this every 14 inches to mark off the height for each chevron stripe. I put the marks directly into where the walls meet because I wanted the stripes to go from edge to edge, floor to ceiling. All my top points are where the wall meets the ceiling and the same for the floor. Now, you could go all "grid lines" and mark off the boxes like in the drawing, but instead of making a ton of marks on the wall that I would later have to try to get off of the light parts, I used a level and a pencil. I measured 19 inches out and marked it off on the top of the level with a marker. I then matched up the corner of the level with my first mark, held it flesh with the wall and moved it until it was perfectly level, and marked the wall at the 19 inch mark. 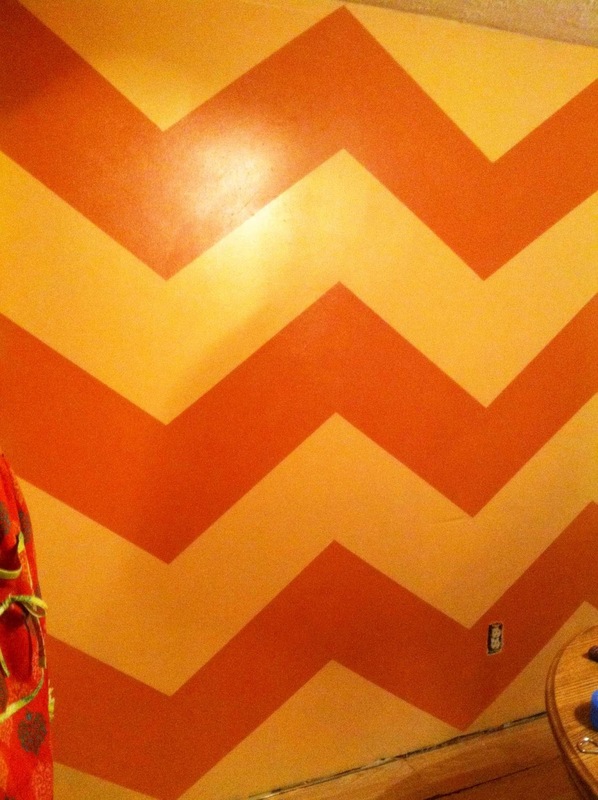 I repeated this across the length of the wall for every 19 inches, and for each stripe height at 14 inches. When I was done it looked like a giant connect-the-dots. I also found that my walls aren't completely square, so making sure that the marks were level with one another actually was quite beneficial in the end! 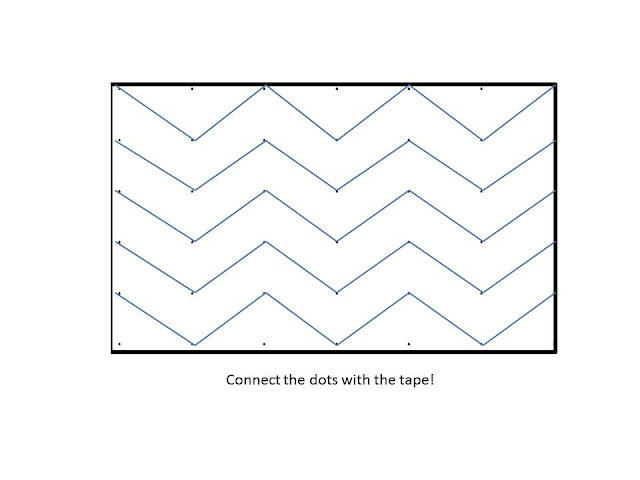 Now that you have the dots plotted out, it is time to tape! This is the part that scared me the most! Again, I started at the left and taped from left to right, that way when it came time to pull off the tape, it overlapped and pulled off in a single strip. 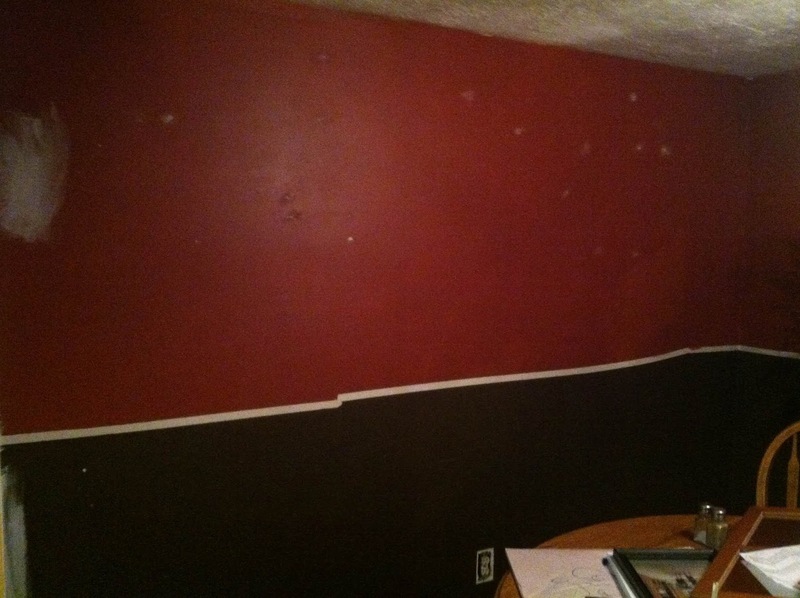 This means the stripe that will stay the color on the wall will look NARROWER than the stripe you are going to paint, because of the width of the tape. Notice how the areas with the marks (for NO PAINTING) seem to be thinner than the others. 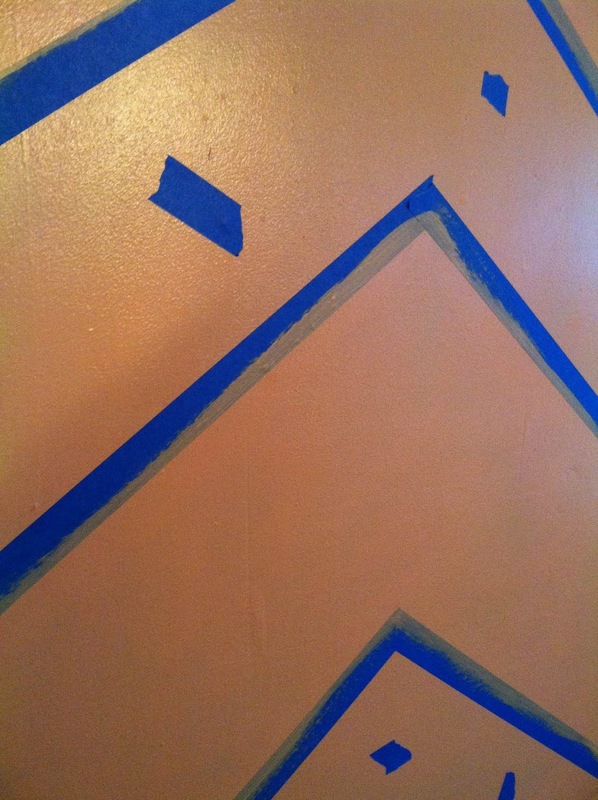 I placed the tape to the "outside" of each stripe that will painted. 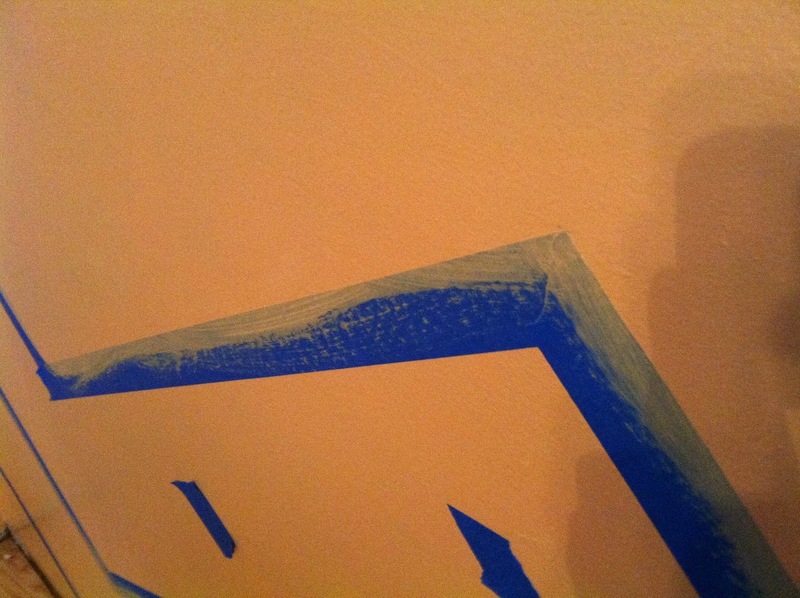 As you tape the walls, run your finger along the edge you will painting to really seal it against the wall. You want crisp lines for this! Now, where the tape overlaps to create a point inside the chevron stripe you will be painting, use an X-acto knife to clean up the edges to create the point. In the photo above I had to cut the bottom strips since it will be painted over. And in this photo I didn't have to cut the corner because the paint will be underneath where the tape meets. Gosh, I hope this makes sense!! 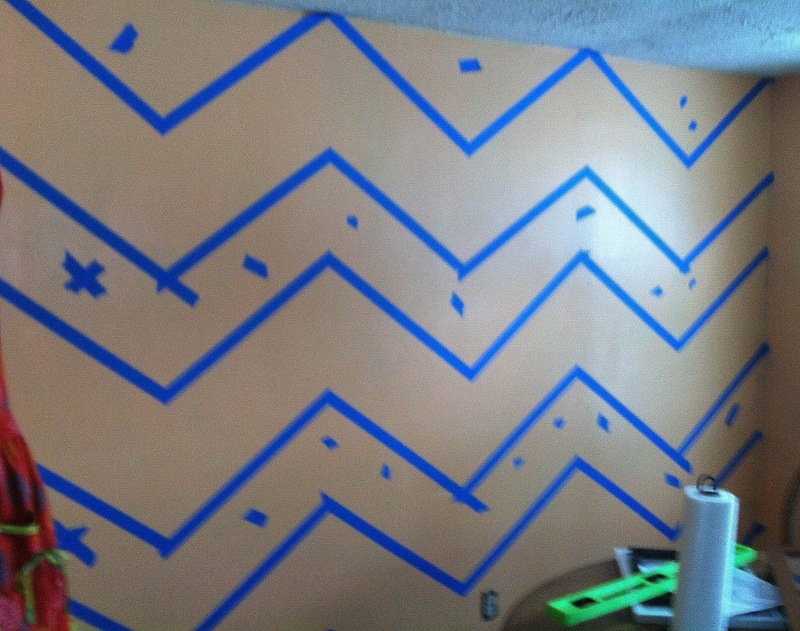 Now that it is all taped off, use the color of paint you already have on the wall to paint along the side of the tape that you will be painting the darker color. You want to paint it the same color to seep into the little places in the wall texture that the tape doesn't adhere to. This will help seal it and create a clean crisp edge. I painted just a thin layer, as you can see in this photo, and then once I was done I just switched to my new color and started painting the chevron stripes in! I rolled it on, and had to use 3 coats to get it covered well. 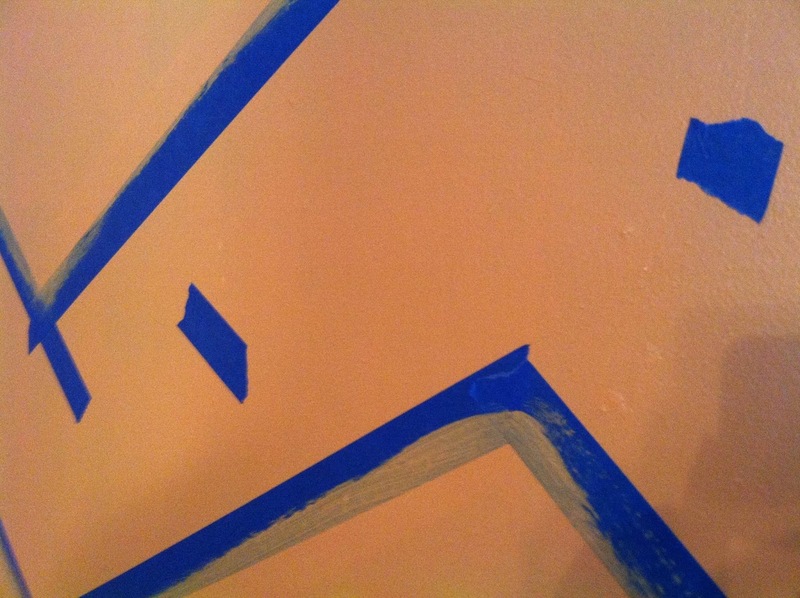 (I went across the wall and then repeated at the beginning, I didn't let the paint set long in between coats). Then I let the paint dry for about 20 minutes after I was done. I slowly peeled the tape away, starting at the left side and worked across. And I was amazed by the results! I didn't have any paint seep under the tape, nor did I have any big chunks comes off when I peeled the tape away. After it dried completely, I erased the pencil marks I could see in the lighter areas and that was it! 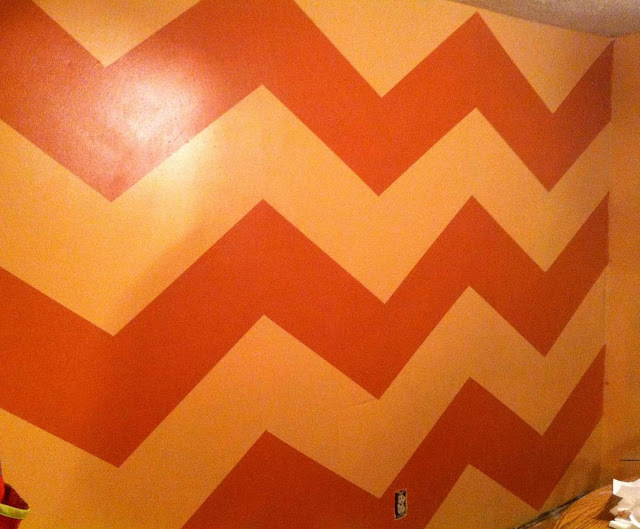 Good luck with your chevron painting adventure! Sorry for the lighting, it was a last minute photo and the lighting wasn't great. But the colors are a light brown/mocha type color and then a light blue. It turned out amazing! She has really tall ceilings, so it was a lot of work, with a ladder...to see more pictures of her front room re-do, check out her blog!